The Brand portal is one of the ways of accessing Elvis through a Web browser. 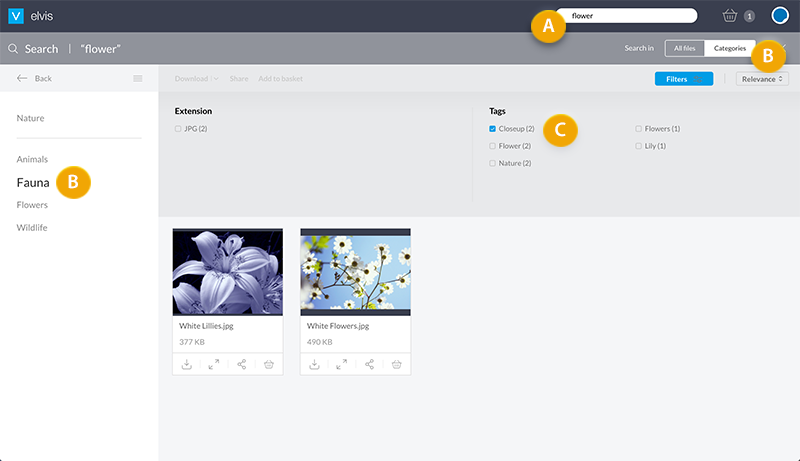 It provides easy access to content that is stored in Elvis and because of its limited features it is perfect for general use. Info: The Brand portal is available in Elvis 5.9 and higher and replaces the Elvis Basic Web client of previous versions. For more information about using the Basic Web client, see Using the Basic Web client of Elvis 5. Your system administrator will have set up the Brand portal for you, ready for use. No installation or configuration steps are needed on your side. Depending on your role, you will have been given full or limited access to the available features in the Brand portal and the assets stored in Elvis. You may therefore not see all of the features described here in this article or be able to use them. When in doubt, contact your system administrator. The look and feel of the Brand portal can be changed to match the style of the brand that the Brand portal is used for, for example by matching it with the branding of a company, product or publication. The Brand portal may therefore look different than shown here but the described features are the same. You access the Brand portal through a Web link by using a supported Web browser. Enter the link that is provided by your system administrator and log in using your credentials. When you have a Basic user license, the Brand portal will immediately appear. When you have a Standard or Pro user license, or when you are a Super user, the Pro client appears. Click your Avatar and from the menu choose Brand portal. Most features of the Brand portal are straightforward to use and self explanatory, but to get you started some of the main features are described in short below. There are various ways of searching for files. The easiest way is to simply enter a search term in the Search box and subsequently pressing Enter. Depending on how the Brand portal is configured, browse through the assets by using either the list of Categories or the list of taxonomies that is displayed on the left side of the page. 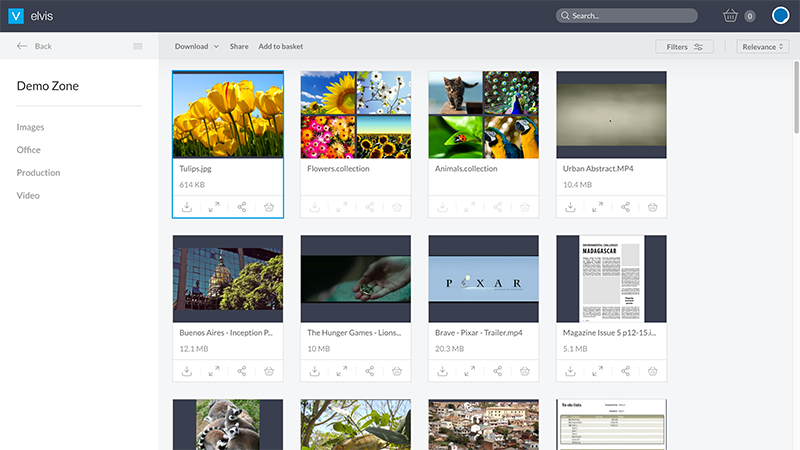 In the Brand portal, Categories represent folders in Elvis. Therefore, instead of working with a folder structure, you work with Categories instead. You can also start by first choosing a Category or taxonomy and to then only search within that group of assets. Once files have been found, use the Filters to further narrow down the results, for example by choosing a tag. Figure: In this example a search is done for the term 'flower' (A), in Category 'Fauna' (B) and the results are further narrowed down by choosing one of the available tags (C). For more information, see Searching for files using the Brand portal of Elvis 5. 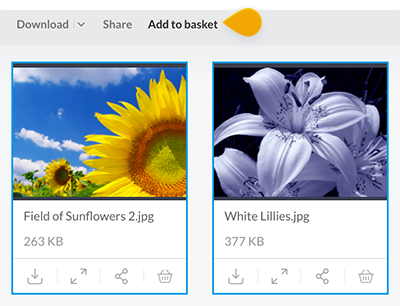 When you want to download or share multiple files that are stored in various locations, it is recommended to first add all these files to a 'Basket' so that you can easily work on them from within a single screen. Figure: Downloading or sharing multiple files from various locations can most easily be done by first adding them to the Basket. To add a single file to the Basket, click the Basket icon in the thumbnail for that file. To add multiple files to the Basket, select some files and choose Add to basket from the menu bar. To remove a file from the Basket, click the Basket icon in the thumbnail for that file (anywhere in the Brand portal) or select them in the Basket and choose 'Remove from basket' in the menu bar. A counter next to your Avatar tells you how many files you currently have in the Basket. To access the Basket, click the Basket icon next to your Avatar. To quickly download the original version of the file, click the download icon in the thumbnail for that file. 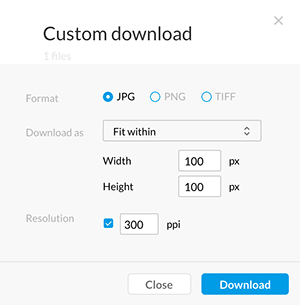 Sometimes you may want to download a file in a different size, width, height or resolution than the original file. To do so, click Custom Download and make a choice from the available options. Your system administrator may also create Download Presets for you containing often used settings so that you don't have to go through the steps of creating a custom download each time. Such presets appear above the Custom Download option in the menu. Sharing files with other people is done by creating a Share Link: a link to a Web page in which the files can be viewed and downloaded. Simply send the link to anyone who you want to share the files with and they will be able to access them straight away; no log in is required. 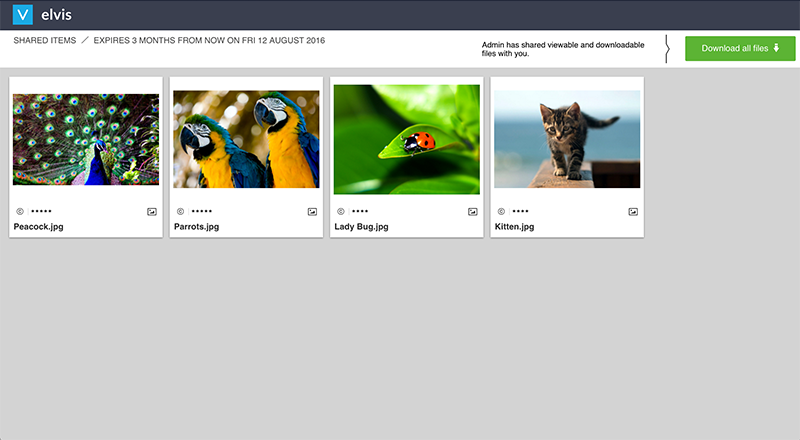 Figure: Share Links make it easy to share files with other people. To share a single file, click the 'Share file' icon in the thumbnail of the file. To share multiple files, select some files and choose Share from the menu bar. If you have found a set of files and you want to save the search results for later use, simply create a Bookmark in your Web browser. If you want to share your results with another Brand portal user or Pro client user, simple send them the link. When accessing it, they will see the exact same results as you (as long as they have sufficient access rights to the files of course). 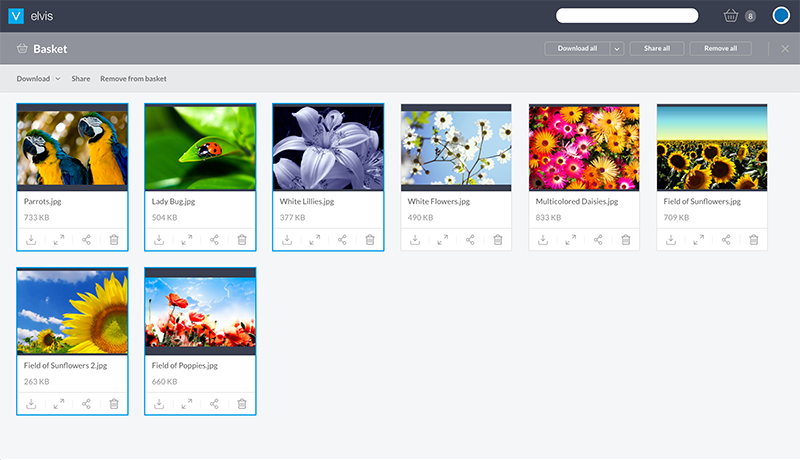 All this information is stored within the file itself and the Brand portal relies heavily on it, for example to allow you to quickly search for files. With each thumbnail, only the file name and file size is shown. 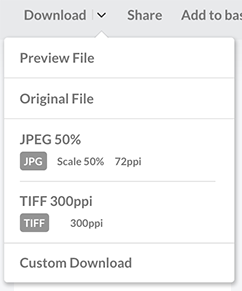 To view all metadata, preview the file and in the top right corner of the Preview window click the Info icon. Figure: Viewing the metadata of a file can be done by clicking the Info icon in the Preview window. 13 April 2017: Added references to search for files using taxonomies. 1 March 2017: Added the option of changing the background image of the Sign In page and the favicon. 6 October 2016: Updated statement about the Brand portal replacing the Basic Web client.